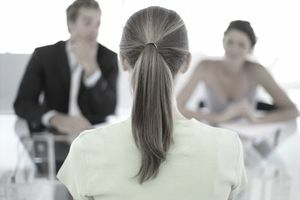 In a behavioral job interview, the company asks questions about your past work experiences in order to find out if you have the skills needed for the job. Behavioral interview questions focus on how you handled various work situations in the past. Your response will reveal your skills, abilities, and personality. The logic behind this interview tactic is that your behavior in the past reflects and predicts how you will behave in the future. But remember the interviewer isn’t necessarily asking yes or no questions, and it may help to review how to answer interview questions without a right (or wrong) answer. Respond to questions with specific examples of how you have previously handled situations in the workplace. Answers to behavior interview questions should be in the form of a brief anecdote that illustrates your strengths and skills as a worker. Provide background on the situation, the specific actions you took, and the results. Review examples of the questions you may be asked during a behavioral job interview and think about how you would answer them. That way you'll be prepared ahead of time, rather than having to think of a response on the spot during the interview. (R) Results. Explain the result of your actions. For example, if your actions resulted in completing a task, resolving a conflict, improving your company’s sales record, etc., explain this. Try to focus on how your actions resulted in a success for the company. Take Your Time. It’s okay to take a moment before answering the question. Take a breath, or a sip of water, or simply pause. This will give you time to calm any nerves and think of an anecdote that appropriately answers the question. Prepare Ahead of Time. Review common behavioral interview questions ahead of time and practice your answers. This will help you ensure that you have a number of thoughtful anecdotes ready to answer any behavioral interview questions. Follow the STAR Technique. Be sure to answer any questions using the STAR technique described above. By completing each of the four steps, you will provide a thorough answer without rambling or getting off topic. Be Positive. Often, behavioral interview questions require you to focus on a problem or a failure at work. Describe the problem or issue you faced, but don’t focus too much on the negative. Quickly shift to describing how you solved the problem and the positive results. Read through the behavioral interview questions below. Practice answering some of these, using the STAR technique to provide complete answers. It may also help to review these common behavioral interview questions with answers. Have you been in a situation where you didn't have enough work to do? Have you ever dealt with company policy you weren't in agreement with? How? Give an example of how you've worked on a team. Do you listen? Give an example of when you did or when you didn't listen.